Volkswagen AG was unable to agree on a new leader for its Audi unit after a lengthy meeting Monday, Bloomberg reports. German authorities arrested Audi CEO Rupert Stadler as part of a probe into emissions test cheating. Stadler has led Audi since 2007. 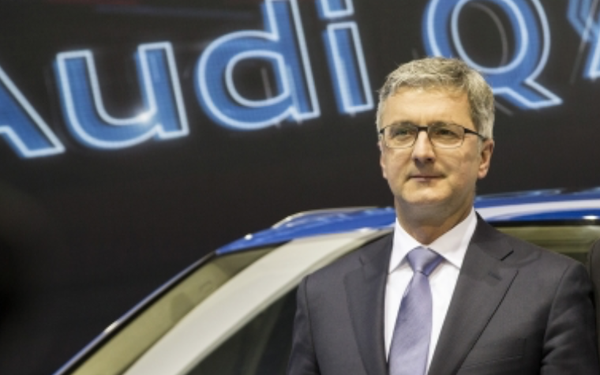 Plans by VW stakeholders to appoint Audi sales chief Bram Schot as the unit’s interim chief executive officer encountered resistance people familiar with the matter told Bloomberg. Stadler is the most senior company official to be detained so far since Volkswagen admitted in September 2015 to using illegal software to rig U.S. emissions tests on diesel engines. The probe was widened into Audi earlier this month. Munich prosecutors said Stadler was being held due to fears he might hinder their investigation into the scandal, according to Reuters. The 55-year-old was arrested at his home in Ingolstadt in the early hours on Monday, they said. Sister company Volkswagen experienced serious declines in brand reputation after the emissions scandal broke, and Audi could face a similar fate depending on what the investigation uncovers. According to the data from the Reputation Institute, VW had the lowest index score in 2016 since 2011. The automaker had a score of about 77 points in both 2011 and 2012, and kept an average of nearly 75 points until 2016, when this figure dropped to 61.3. VW has been working diligently at rebuilding its brand and 2017 showed some promise. The automaker logged record global sales topping 10 million and pushing it past Japanese rival Toyota to become the world’s largest automaker. In the U.S., sales rose 5% for the year. However, the brand sold barely half as many vehicles as it did at its peak, back in the 1960s and 1970s. It is the toxic culture at VW and Audi that is at fault for “Dieselgate,” said David Kiley, author of Getting the Bugs Out: The Rise, Fall and Comeback of VW in America (John Wiley 2001) who is working on a new book about Volkswagen. However, he is optimistic about the brand’s future.